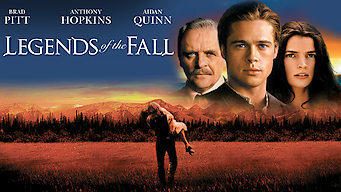 How to watch Legends of the Fall (1994) on Netflix Argentina! Sorry, Legends of the Fall is not available on Argentine Netflix, but you can unlock it right now in Argentina and start watching! With a few simple steps you can change your Netflix region to a country like Taiwan and start watching Taiwanese Netflix, which includes Legends of the Fall. We'll keep checking Netflix Argentina for Legends of the Fall, and this page will be updated with any changes. Legends of the Fall is not available in Argentina BUT it can be unlocked and viewed! The Ludlow clan -- father William and brothers Alfred, Tristan and Sam -- splinters when Sam leaves to fight in World War I against his dad's wishes. Out in the Western wild, a family is torn apart by war -- and a brotherly bond is tested by a woman. There is a way to watch Legends of the Fall in Argentina, even though it isn't currently available on Netflix locally. What you need is a system that lets you change your Netflix country. With a few simple steps you can be watching Legends of the Fall and thousands of other titles! Watch "Legends of the Fall"